“What are you doing with all of the toilet paper you are stealing from the cabinets?” I asked an unsuspecting W Sunday morning when he returned from his weekend camping trip with the Scouts. “The extra rolls of toilet paper you are taking from the cabinets? What are you doing with them, and where are you putting them?” I asked again. The conversation had begun the night before, when he wasn’t here, which is why he didn’t see it coming. I had gone into the kids’ bathroom to get some medication for a coughing, sniffling kid, and I noticed there was no toilet paper in the holder. (Now, I’d love to rant about why the paper roll can be empty and no one would address the issue, but I’ll save that for another time.) When I opened the cabinet to replace the paper, there was none. “You did,” responded C. “You gave me like four rolls about a week ago.” Yep. My recollection, exactly. “Yeah, right here,” he said, opening the cabinet. He turned and opened the cabinet under the sink, just to check that he hadn’t put them in the wrong place. And so the conversation turned focus to W, who was always experimenting on something… and always using household goods to do so. Then it devolved to the neighbors with keys to our house, and the fact that they might be coming in for toilet paper. After all, who would notice if a roll (or two) of toilet paper disappeared here and there? And so today, since the other two kids had blamed W, I figured I’d pull him into the mix before I settled on the neighbors. “Is this like the spoons?” W finally asked. Ah, the spoons! I had forgotten about the spoons. With three teens in the house, we never have enough spoons. At one point, I accused the boys of ferreting them off and melting them down to make something more interesting: swords, knives, etc. More recently, my measuring spoons went missing. But not all of my measuring spoons, just the ¼ teaspoons. All of my ¼ teaspoons, of which I once had four and have since located one. I didn’t blame anyone in particular that time. I just mentioned that someone must be coming into our house and stealing my ¼ teaspoons. “Yes! This is just like the spoons!” I answered, too jubilantly. “What’s the problem in there?” J hollered in from the living room. “Just Mom being all paranoid again. Something about the toilet paper…. She thinks the neighbors are stealing our toilet paper.” We all three dissolved into giggles. My “paranoia” is my way of using the little issues to have some fun. What the kids don’t realize is that if I didn’t express my “paranoia,” I would be pointing the finger at them and requesting that they work to curb their excessive use of essential household staples. Or maybe I am pointing at them…. My culinary kid admitted to something by accident last night. And now I know the truth. He started the school year in his culinary program with the basics: knife skills, chopping and cutting, and moved on to stocks, soups, salads, and sandwiches. I asked him if he got to bring anything home. “No Mom. We package it and sell it in the café,” because yes, vocational schools have cafés where teachers, students, staff, etc. can buy lunch and ready made dinners. It’s a great idea, really. Except for the fact that the culinary students don’t get to take any food home to test on their parents. Second semester, my son moved to baking, and he has been studying the various processes involved in baking. So far, I have heard about the banana bread, the blueberry crumb cake, and the rolls. For the last two weeks, I’ve been hearing about the rolls. When I (once again) asked him if he would be bringing any of his baked goods home for sampling, he said no. Then he said, “The blueberry crumb cake wasn’t very good, anyway.” Okay then. Stop. Right. There. My mind got stuck on the big bag from the rolls I brought. I didn’t hear anything else that was part of the sculpture because my mind stopped at that phrase. I realized he brought rolls from culinary. “And you gave them out to your friends? At school? Without bringing any home?” Clearly, I must have misheard him. “Why didn’t you bring one home so I could try it?” After all, I’ve only been asking since September, I wanted to say. “Because I only brought six,” he paused here while he attempted to concoct a reason. “And I had plans for them.” And he turned back to his siblings and started talking about the people who were lucky enough to get a roll. Freshly baked. From his culinary class. “You know what, C?” I interrupted his story. “I’m going to bake some cookies tomorrow, and I’m not going to give you any.” He turned to me. I looked him right in the eyes, my stare intense and unwavering. “Because I have plans for them.” I winked and smiled. So now he knows the truth. 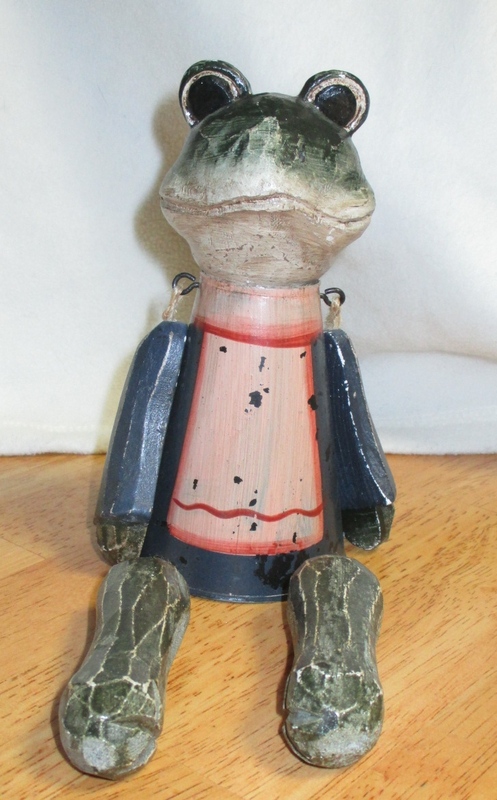 When I was younger, I had a collection of knickknack frogs. One of these—made of tin and wood with limbs that dangle from joints of twine and wire—was a gift that I received many years ago, and it has a simplicity to it that is reminiscent of an earlier era. As I have moved residences over the years, I’ve pared down my collection to my favorites. This particular frog remained as it reminded me of my past for reasons I can’t exactly pinpoint. In the townhouse where I landed with my children after my divorce, the frog took up residence on a shelf that held some books and a few ornamental items. Seldom did I notice it sitting there in its decorative, take-up-space kind of way. One day when my children were still fairly young, I found this very frog sitting in the middle of my propane heat stove, right next to a candle that I had placed there at the end of the most recent heating season. It was late spring, and warm enough out that the windows had been open with regularity. The sight of the frog startled me because I wasn’t expecting it to be there. How odd, I thought. I wonder who put that there? It seemed like a bold placement for such an object, and I picked it up and moved it back to its normal location on the shelf. The next morning, I woke the children, and I took a quick trip to the basement laundry room to gather some clothes. As I passed through the living room, I stopped abruptly, startled when I spotted the frog, once again sitting proudly—albeit unexpectedly—on the heat stove. The children were upstairs waking and preparing for school. I glanced around the room, not really sure what I was looking for. The room was empty. I set the laundry basket on the floor, and returned the frog to his spot on the bookshelf. I took a deep breath, shaking off my surprise, and I went about my morning preparations. When I was ready for the day, I went downstairs to the kitchen. I opened the door to welcome the spring air, and went to the back of the house to open the back door. Mid-way through the living room, I froze. There, on the stove, was the frog, sitting right in the middle where he’d been twice, now three times. My heart pounded in my chest as I thought through the possibilities. I glanced around the room expecting the unexpected, only daring to move my head. I pondered going to the basement to look around, but I couldn’t do it. Not alone. I went to the kitchen phone and called my neighbor. “I’ll be right there.” She arrived a minute later, wielding a kitchen knife. She looked down and shrugged, smiling weakly. “It’s better than nothing!” Together, we searched the house while I explained the unexplainable to her. We found nothing, but we got a good laugh. We concluded that one of the children was playing a trick on me. No one would fess up. It wasn’t until several months later that my oldest finally admitted to moving the frog. He read in a book how to secretly move an object. Or something. I have to say, he got me good, and we will forever joke about it. Since that experience, the mere sight of this little frog holds an unexpected emotional charge. When I happen to see it sitting (usually in its normal place) on the shelf, I have a momentary jump in heart-rate, as if its very glance in my direction has power beyond its inanimate self. Then I laugh at the memory. I was driving my daughter home from dance the other night, listening to the radio, and absently pulling on the material of my pant legs. We had been having a conversation about dance, play practice, school, and what was for dinner. A song came on the radio, and I started to sing. Suddenly, my daughter looked down at my leg. “Are you wearing leggings?” she asked in that incredulous tone that teenagers use to indicate that their parents are doing something unbelievably ignorant. “Good! There are a lot of people who wear leggings who shouldn’t,” she continued, clearly not thinking through the implications of what she was saying. But her dialogue was effective. Immediately, visions of people who shouldn’t wear leggings entered my mind. Then I thought about her comment. “I’m sorry…. Are you saying I shouldn’t wear leggings?” I asked. “I have some leggings,” I admitted. “Is it bad for me to wear them? Is there something that says I shouldn’t wear leggings? Maybe I’m too … old?” I wasn’t trying to push her. I was just trying to figure out the teenage rules for what mothers should wear. I wouldn’t want to cross any invisible lines. “Really, Mom?” That was it. No explanation. No further comment. Just, really? “How about if I wear them tomorrow?” I pressed. “I have something that I could wear with them that would be completely appropriate.” I waited for her reply. Yes, the fashion police now live in my house. The fashion police take notice of all adult wardrobe faux pas, and “they” are not afraid to intervene…. It has been a cold winter; there is no question about that. Even in the early days of March, the morning temperature still hovers around the 0° point. One day recently, I went into the kitchen at just about the crack of dawn and glanced at our indoor/outdoor thermometer. The outdoor temperature read -1°. This fact barely registered in my brain; the morning low had been nearly the same for days, maybe weeks. I went about my early morning business packing lunches, filling water bottles, and overseeing the consumption of breakfast. My mind was not fully on the task at hand because I was pondering the day ahead. W came to the kitchen, puttered around for a minute longer than usual, and fixed himself breakfast. C stumbled down the stairs next. He stood in front of the open fridge for a moment, declared the space void of anything edible, and began packing his backpack. Sandwiches were made, thermoses filled. I moved on to water bottles. J made her way down the stairs, popped a bagel in the toaster, and sleepily sat at the table. I pulled the pitcher of water from the fridge and began pouring it into the bottles. Why the alarm? I wondered. Not registering that I had already checked the temperature, I looked at the windowsill. The thermometer read -17°. My mind ticked back through its stash of morning snapshots. Confusion tugged at the edges of my memory. It wasn’t that cold a few minutes ago. Was it? Had it really dropped so fast? What was going on? All of these thoughts slipped through my mind, one after the other, like a deck of cards being shuffled. Overhearing the conversation, W came in to the kitchen from the living room. “I suppose I should change that back to Fahrenheit, huh?” he said. He picked up the thermometer and pressed the Celsius/Fahrenheit toggle button. He ducked his head to hide the mischief evident in his satisfied smirk as he made a quick retreat to the other room. Yes, we always have to be on our toes in my house. You just never know who is up to mischief!